Sites like Kickstarter, Gofundme, and Indiegogo have just gotten bigger over the years – and they're obviously still the big kids on the block. But a more recent frontrunner is Patreon. This site is a little bit different as it's more about funding content creation and pays out when the content is digitally delivered. Why not start a road vlog, share live videos of your shows, or ask patrons to make live requests (all for a price, of course)? If you've got a fanbase, this is a great way to keep them active and interested while you tour – and get some money in the process. A lot of artists feel bad or shy about asking for money, but the fact is, they shouldn't. Remember, you're providing something people enjoy (your art) and you deserve appropriate compensation for that. When you buy a new car, the auto maker doesn't just say, “Shucks...go ahead and take it. It's just a little something I came up with in my free time.” It's the same with music. Stand up for your career, and don't be afraid to ask your fans for help – they want to support you! When you mention touring, most bands and artists think of big stages, bright lights, shiny tour buses and massive stadium crowds. That absolutely can and does happen – but you can save some money (and potentially have a more lucrative tour) if you're willing to be a little more flexible. In the last couple of years, house concerts have become all the rage – in fact, there are often whole areas of the country that regularly host house concerts. From my understanding, they pay well – sometimes very well – and best of all there is a small, attentive crowd. A smaller venue isn't necessarily a bad thing, especially if you pack it. And being in an intimate setting can earn you quality face time with potential fans and bookers – more so than a loud club or cavernous venue. Concerts In Your Home is one company that does this, but there are others – get out there and find opportunities! You can also consider cutting costs further by asking fans or house concert hosts to put you up as you travel on the road. This can save serious money – sometimes hotels are expensive, and may not be worth the money if you're only staying a few hours before driving on. I know many artists who have done very well for themselves by touring this way – playing house concerts and keeping costs low by couch surfing. If your style of music is appropriate for venues like this, I would advise you to seriously consider it! Especially once you're on tour, you absolutely must have something to sell. The margins on things like T-shirts and even stickers can be pretty good, and if you sell a lot of them, that can mean the difference between skipping a meal or making a pit stop for hot food. But there's no reason you can't ask your fans to buy your merch – even if you're not currently playing a gig. Make a post on your favorite social media site explaining that you're going on tour and need to drum up some cash – maybe even have some kind of sale. Most fans will be more than happy to help you – especially since they're getting something out of it, too! Something else that can help lower your costs further (not to mention saving space in the van) is not pressing CDs. I've been seeing a lot of bands sell download cards lately with their albums or songs on them – several bands I've seen had no physical CDs at all. If you feel your fanbase will demand physical media, by all means go for it. But if you think you can get away with going digital, I would definitely advise it. Things are frequently changing in the music world, especially with the rise of DIY artists. 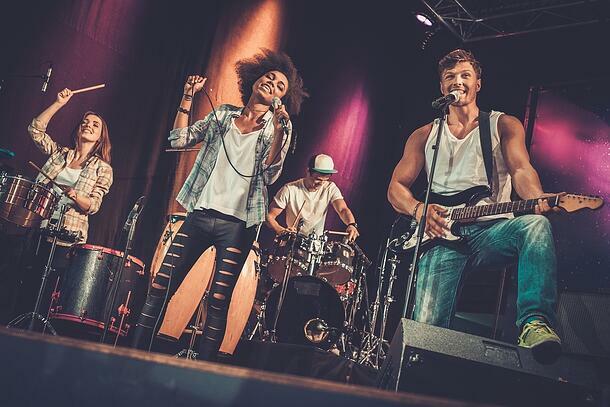 Bands are constantly devising new ways to cut costs, boost profits, and connect with their fans. Familiarize yourselves with the latest strategies – or better yet, create your own! You can tour successfully without breaking the bank, and hopefully make a profit in the process.